Forbes talks about how Apple dumping Google Maps might hit Google’s revenue, but most of us don’t really worry about how much billions Apple and Google make. Maybe Google is a little unsure, but what about us? 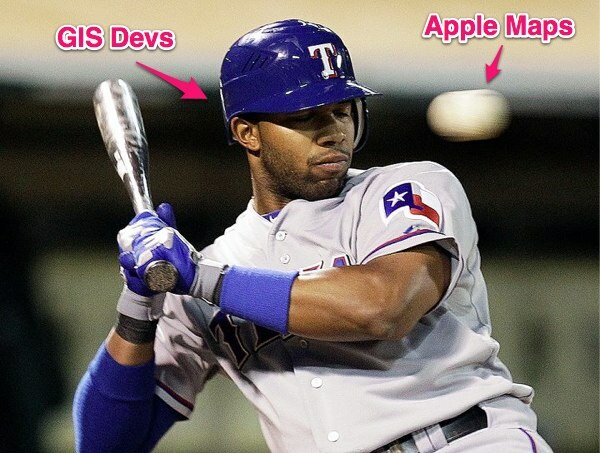 First off, I suspect this mapping API from Apple will be free to developers on iOS devices. So while that might be a large segment of the mobile market, most of us don’t develop exclusively on iOS. Thus in the short term, it becomes one more API we must learn if we are deploying to Apple devices. Maybe Apple will extended it to OS X (possibly eventually the web), but for now I suspect this this will iOS only as Apple is really only concerned if you use their hardware. So you might decide to migrate your Google or Mapbox tiles to Apple on iOS, but you’ll still need to use Google or Mapbox on other platforms. Second, it might not be useful for GIS applications. Putting any pushpin on a map is easy, but overlaying lines and polygons on top of what might be a beautiful map but noisy, means that users might not be able to see what you are showing them. I’ve always like whitelabel maps that basically give you just enough to navigate, but don’t show you features that aren’t relevant to your product. Apple may get there one day, but I’m going to guess their map they show this week will be beautiful and difficult for us to work with. Third, if you are already using Google or Mapbox, do you really need to switch? No if things are working well for you. Change for the sake of change is never good. There is no shortage of map tiling options for developers on mobile devices and the Apple one might not be good for us. I guess we’ll know soon.